4Videosoft PDF to Image Converter has the ability to convert PDF to different Image formats like JPEG, PNG, GIF, BMP, TGA, PPM, JPEG 2000 and TIFF. You can view the PDF file at the preview window and set the output page(s) and output folder. Besisdes, this PDF to Image Converter has different output settings, such as output format, size, color, JPEG quality, TIFF compression, etc. Also, you can use it to set the play speed for multi-pages PDF files. 4Videosoft PDF to Image Converter can convert PDF to most of image formats for users to put them in the portable devices, like converting PDF to JPEG, GIF, TIFF, PNG, BMP, TGA, etc. This PDF to Image Converter allows users to set output color as colorful, greyscale or monochrome and set the size of output file. 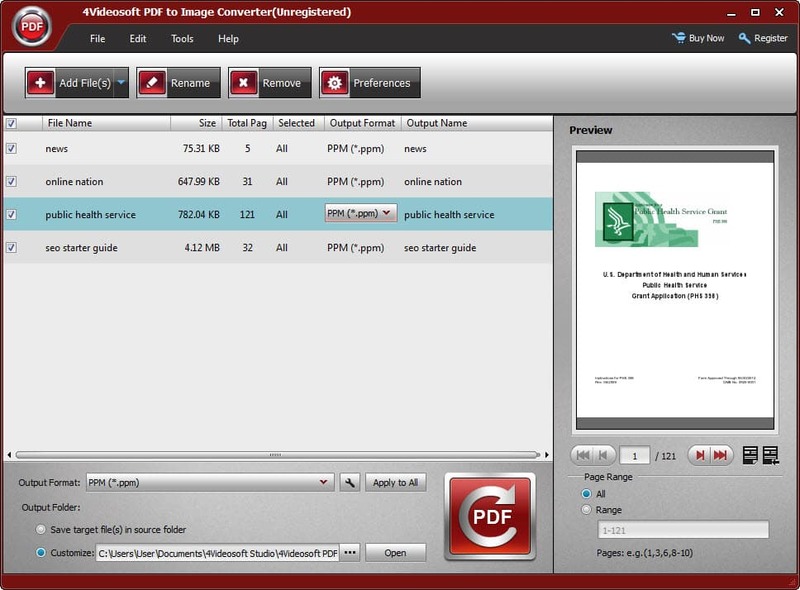 This PDF to Image Converter supports to convert All Pages, Current Page or the selected page number you want to convert. 4Videosoft PDF to Image Converter has the intuitive and user-friendly interface to help beginners easily and rapidly convert PDF to Images without any assistant tools. Language such as English, Turkish, Thai, Latin, Korean, Greek, Cyrillic, Arabic, Japanese, and Chinese are supported by this 4Videosoft PDF to Image Converter. 4Videosoft PDF to Image Converter has the advanced technology to convert PDF to Image with super fast speed and excellent quality. Convert all PDF files to any image formats for you to choose with high quality. Convert multi-language PDF files to docx/rtf format with the OCR technology. Convert your multi-language PDF files to ePub format with the OCR technology. Convert PDF file and finally output an eBook format supported by mobile devices.